When Ariel mentions another human holiday, the women get excited. They aren’t the only ones, though. The Dragon Lords, Vox, and Ha’ven decide they want to be part of the planning this time. 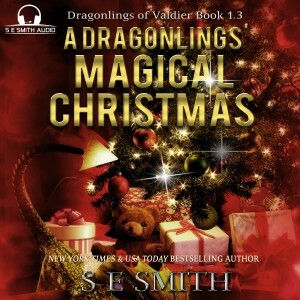 Things get a little out of hand when the men begin competing with each other to create the best Christmas ever for the Dragonlings, Roam, and Alice. Fuelled with tales of St. Nick, Rudolph, Frosty, and the newest tale of the Old Dragon of the Mountain, they are determined to light up the palace like never before and turn it into the new North Pole. Just when the women think they have everything under control, panic ignites when the Dragonlings, Roam, and Alice suddenly disappear just days before Christmas. What no one expects is for the children to take it upon themselves to go search for the legendary dragon who has threatened to steal the Magic of Christmas. Now, their parents are in a race to find the Dragonlings before they lose them forever. Will they be able to find them and celebrate the magic of the season or will the Dragon of the Mountain keep them hidden forever?